During the raising process of the puppies, I turn the house into “puppyville”. Yes, our puppies are raised in our home. Puppies are whelped in our den and stay with us for eight weeks. Between Day 3 through 16 we use the “Bio Sensor” program. Some people call this the “Super Dog” program. It is quite fascinating and you can read all about it at http://breedingbetterdogs.com/pdfFiles/articles/early_neurological_stimulation_en.pdf . Transitional Period ( 14-21 days) Teeth emerge, hearing develops, and puppies will begin to walk vs crawl. Breeders should be giving increased individual time to each puppy. Toys and others fun visual objects should be placed in the box. Puppies can move to another part of the home such as the kitchen for more stimulation. Awareness Period ( 21-28 days) The puppies have all senses. Tapes with a variety of sounds are played around the clock. Puppies will startle at some of the sounds and learn to return to normal on their own. Puppies begin to play and mounting behaviors can be observed. Visitation begins for all families if mom and babies are doing well. Puppy Parties will continue until puppies go home. 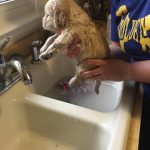 Be aware , I have no problem putting visitors to work bathing puppies . I want you to be as involved as you would like early on with the puppies. Identification Week(28-35 days) Play behavior is much more intense. Play will include growling, and chase games. Puppies need mental challenges so I will add things for them to chew on, push , climb on, toys that littermates can jointly tug on. 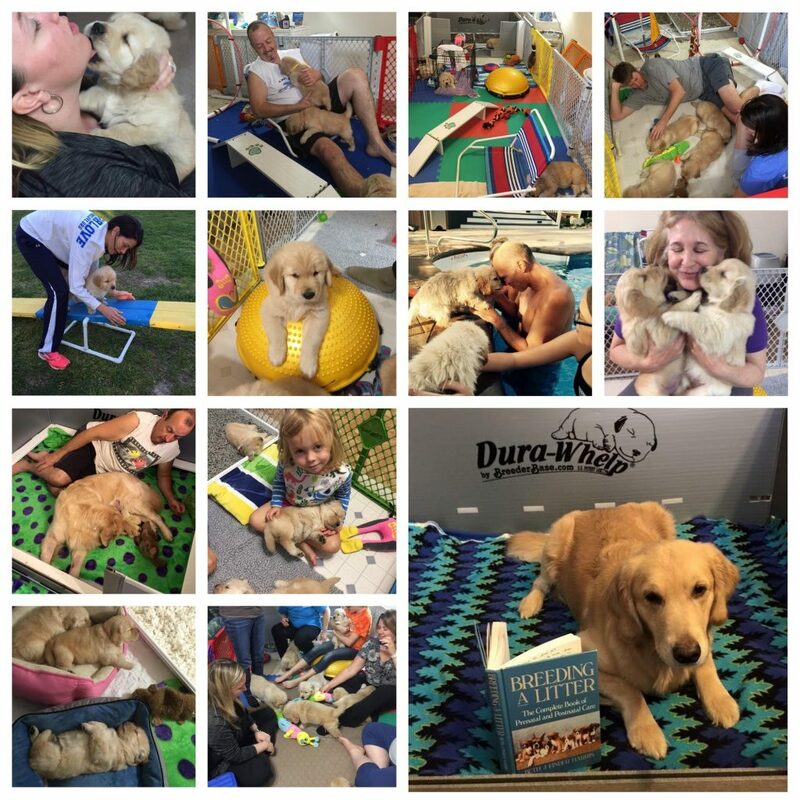 Puppies are learning to problem solve and play will develop strength, coordination and agility. Puppies will spend time away from the litter and behavior observed. The play area includes all types of surfaces for exploration and lots of visitors to interact with. Socialization Period ( Week 5-16) The dogs world becomes a little bigger. House training, weaning, introduction to smells and textures. Week seven we try and swim test all puppies if weather permits. Housetraining Starts: Our den opens up onto a large yard so that puppies have a place to potty and play when outdoor training begins. The bathroom station is made up of litter , so puppies learn early on that the living area and bathroom area are not the same. Research has shown that puppies that are raised with paper or wood shavings are much more difficult to house train. Think about it, what are puppies learning when they are forced to play and potty in the same area? The same holds true about crates. Puppies placed in crates with open bottoms (typical pet shop cage) learn to potty in a crate thus creating a large amount of frustration for owners. IF we as breeders do our job correctly, and you follow the guidelines given, your puppy should be 95 % house trained when it goes home. Breeder Responsibilities: Breeders should be doing everything they can to set up the new owners for success, so transition into the new home is less stressful for all. “Are dogs always a man’s best friend? No, they must be taught.” The foundation of a good dog starts with developmental milestones experienced during puppyhood. Make sure your breeder is earning his/ her paycheck by providing a puppy ready to live in the word. As a breeder and dog trainer, the benefits of early learning make a huge difference in the life of a dog.